The Charlestown Lady Pirate Volleyball team (1-0 & 1-0 MSC) began their 2016 regular season Tuesday evening hosting conference rival Corydon in the CHS Sports Arena. 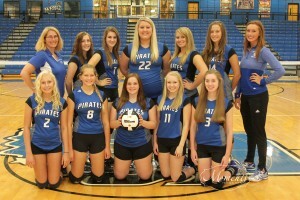 The :ady Pirate Junior Varsity team started the evening off right, defeating Corydon 21-25, 25-13, and 15-3. The Varsity then took care of business, dispatching the Lady Panthers in three sets 27-25, 25-12, and 25-17. “Tonight was a good start to our season. Everyone on the court contributed to the win. I’m proud of the way the girls kept their composure when were down a few points. They never lost their focus, and did a good job communicating on the court”, summarized Lady Pirate Head Coach Tammy Nuxoll. Junior Maddie Nuxoll, the Coyle Chevy Player of the Game as selected by CPPSB, led a balanced offense and distributed the ball allowing several hitters to earn kills. Junior Kiersten James led the team with 9 kills; while Junior Kaia Reid contributed 8 kills; and Seniors Emalee Craven and Amelia McCoy added seven. Junior Chrissa Ledbetter, Junior Hannah Vincent and McCoy led Charlestown in passing stats. Junior Kaia Reid leading the Lady Pirates in the ace category, finishing with five. Charlestown will next host Jeffersonville on Thursday.